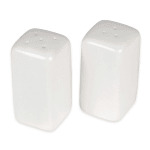 The American Metalcraft CSPS3 salt and pepper shaker set's white color can blend with a variety of place settings. Each shaker has a 21⁄2-ounce capacity for holding salt or pepper. Made of ceramic, the American Metalcraft CSPS3 salt and pepper shaker set is heavy and feels good in the hand.